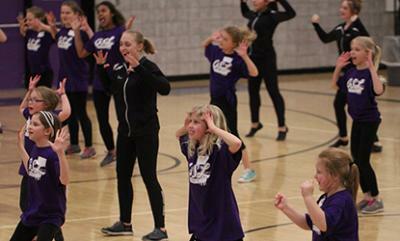 The Glencoe-Silver Lake dance team hit the floor for the final time this season with a bevy of local children during halftime of the Panther boys’ basketball game against Mound Westonka on Tuesday, Feb. 21. The Pantherettes held a dance camp with the children in the GSL cafeteria adjacent to the gymnasium Tuesday afternoon. Campgoers learned dance routines and techniques, including a number to perform for the halftime crowd. Submitted by admin on Wed, 03/01/2017 - 11:33am.